University president takes $90,000 pay cut to improve minimum wage. 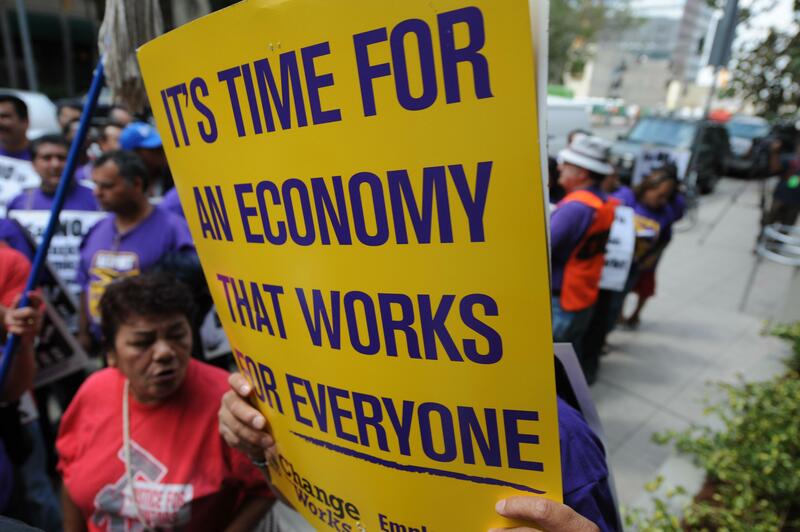 Janitors rally outside a Ralphs supermarket in downtown Los Angeles on April 9, 2009. Raymond Burse recently took over as president of Kentucky State University. With the job—which Burse will do on an interim basis for a year—comes a nice little paycheck to the tune of almost $350,000. Burse, however, took the selfless, and unusual, step of giving himself a $90,000 pay cut so that the lowest paid employees at the university—clocking in at $7.25 an hour—could have their wages increased to a more livable $10.25, the Lexington Herald-Leader reports. The pay raise certainly doesn’t appear to be a publicity stunt, as it will reportedly remain in place, and apply to new hires, even after Burse’s tenure at the school is over.